Are social networks good for African businessmen? In a region where formal institutions are weak and information on price and market conditions are difficult to obtain, traders often rely on interpersonal relations to do business. Unlike industrialized economies where most transactions are impersonal, African traders typically deal with a handful of suppliers and clients that they have known for years. However, a recent article examining the link between economic performance and social networks in three Sahelian countries argues that it depends on to whom they are connected. Social networks may become a burden for those who face too many social obligations. Embeddedness in a business network offers comfort and trust but, in a context where private accumulation is often regarded as anti-social, pressure from kin and clients is also capable of destabilizing prosperous businesses or preventing existing activities from flourishing. This Janus-face aspect of social networks—known to anthropologists as the entrepreneur’s social dilemma—remains understudied in Africa despite its importance for local entrepreneurs. To verify whether the most well-connected traders are also the most successful in business, we conducted a survey among 358 small traders located in five border markets in Nigeria, Niger, and Benin (see Map 1). We asked these entrepreneurs involved in petty trade whether they had been in contacted with or had received support from high-ranking civil servants and politicians, law enforcement officers, and religious leaders—three categories of actors that could act as private creditors, facilitators of administrative formalities or providers of spiritual support. The study confirms that social networks can be simultaneously a resource that positively contributes to labor market outcomes and a social burden that has a negative economic impact on traders’ profits. When differences in age, experience, professional background, and education are taken into account, small traders who are connected to key persons earn 144 percent more profit than those who lack such connections. The size of the social network matters as well: Other things being equal, small traders’ profit increases by 46 percent for each additional key connection. This suggests that social networks are a very valuable resource in a region where almost half of the traders have never attended school and come from farming families. However, the study shows that the effects of social networks on economic performance are heavily dependent on the type of persons with whom traders were connected. Traders who have received support from senior civil servants and politicians are the ones who do best. Their monthly profit is 109 percent higher than the one of other traders, most probably because state representatives often invest a part of their relatively stable income into trading goods that are in great demand or subject to seasonal shortages, such as cement and cereals. Traders well connected to law enforcement officers in charge of supervising the transit of goods across the border enjoy a monthly premium of 71 percent. Being connected to a marabout is, however, detrimental to business. Small traders who frequently visit religious leaders and report strong support from them have a lower monthly profit than other traders (-159 percent), a surprising result considering the close relationship between trade and Islam since precolonial times in West Africa. One possible explanation may be related to the growing influence of Islamist reform movements, such as the Society for the Removal of Innovation and Reinstatement of Tradition, known as Izala, in the region. Anti-Sufi movements such as Izala reprove ostentation and criticize traditional customs. They have found a warm reception among traders for whom social obligations such as donations, naming, burial rites, and marriages often absorb a large part of their assets. Joining a religious group with different internal norms than one’s home community is one of the ways out of the conundrum confronting traders seeking to accumulate wealth without alienating their networks. By providing access to capital, suppliers, and customers, and reducing transaction costs, social networks facilitate business transactions in West Africa. They can also hamper the evolution of business when too much social pressure is exerted on entrepreneurial individuals. Policies that aim at promoting business on the continent should build on the duality of social networks and help businessmen minimize the negative aspects of social embeddedness by facilitating the development of institutions that make the market more transparent and African entrepreneurs less depend on social obligations. Note: Olivier J. Walther is an associate professor in the Department of Political Science at the University of Southern Denmark and a visiting professor at the Division of Global Affairs at Rutgers. He can be reached at ow@sam.sdu.dk. Mathias Kuépié is a Senior Researcher at the Luxembourg Institute for Socio-Economic Research and an associate researcher at DIAL in Paris. He can be reached at mathias.kuepie@liser.lu. Michel Tenikue is a senior researcher at the Luxembourg Institute for Socio-Economic Research. He can be reached at michel.tenikue@liser.lu. Kuépié M, Tenikue M, Walther O. 2015. 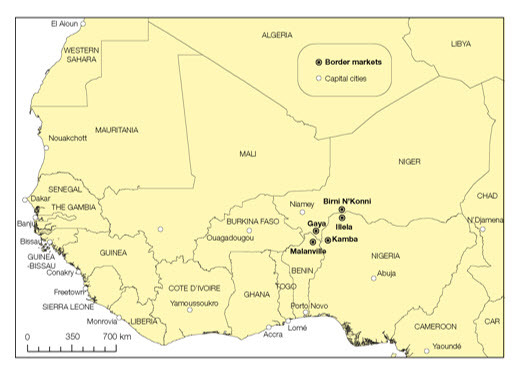 Social networks and small businesses performance in West African border regions. Oxford Development Studies 44(2): 202-219.